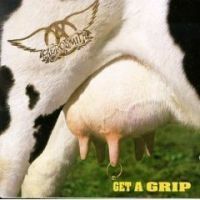 Get a Grip is the eleventh studio album by American Rock band Aerosmith, released in 1993. It was the band's last studio album released by Geffen Records. Get a Grip contains five hit singles, four of which charted in the Top 40 of the Billboard Hot 100, between 1993 and 1994: "Livin' on the Edge", "Eat the Rich", "Cryin'", "Amazing" and "Crazy". The promotional videos for the three latter songs helped launch the careers of actress Alicia Silverstone and vocalist Steven Tyler's daughter Liv.